Two Table Tennis Tables are coming to Park Mall! 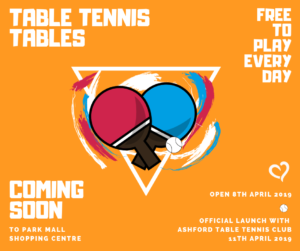 Join Ashford Table Tennis Club for the Official Launch of the new tables. The tables are FREE to play and accessible to all. From 11am – 12:30pm, the club will host a beginners table tennis taster session, where beginners can come and try out the sport and pick up tips and tricks from the experts. From 12:30pm – 2:00pm, trail your skills in a mixed abilities tournament hosted by the town centre based club.